OFI helped rescue adult male orangutan Rusti in 1997 from a backyard zoo in New Jersey. Conditions at the zoo were less than optimal and provoked year long demonstrations by animal activists. After OFI took Rusti to Hawaii, the state of New Jersey closed down the zoo. 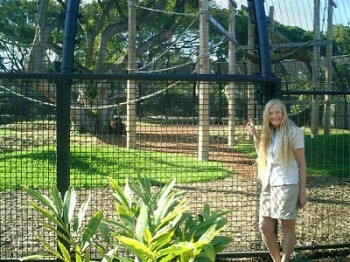 OFI designed a large enclosure for Rusti at the Honolulu Zoo where he is now on permanent loan. The enclosure is arguably the best orangutan enclosure in the U.S. It is very large with grass underfoot and an old hundred fifty year old fig tree, reminiscent of trees in Rusti’s native habitat, in the center of the enclosure. Rusti was joined by Violet, an adult female from the San Diego Zoo. The two proved to be a very compatible couple. This is one story of a rescued animal that truly had a happy ending!